New patented technology maximizes your fishing success! 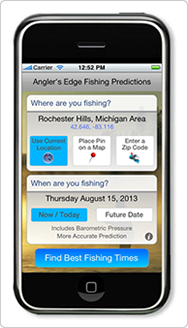 Anglers EDGE™ uses solunar data AND barometric pressure for the most accurate fishing predictions, hour by hour. Many other features are included. Angler's EDGE™ patented technology (Pat. 7,536,375) was developed by wildlife biologists, who are also avid fishermen. Watch for Deerhunter's EDGE™ coming soon. Note that fishing and hunting predictions use different technology because fish and animals live in different environments. Adjust your fishing tactics to feeding behavior of fish. Predictions are only available within in the US. If you'd like to see Angler's Edge™ in your location, please let us know. If we get enough requests, we will add other areas of the world.